I had to do some digging to find this information on the City of Pittsburgh website, so I thought I would repost here in case anyone else was looking for this info. The city’s website is a little confusing and links to some outdated information. The information included here should be correct – if not, please let me know.I’ve added a section for other recycling options at the bottom. If you know of other places to recycle items that are not accepted by the city – please leave a comment below and I will update the list. The city of Pittsburgh offers curbside recycling for homes and apartment buildings with 5 units or less. Curbside recycling is picked up every-other week. The curbside recycling schedule is available here. 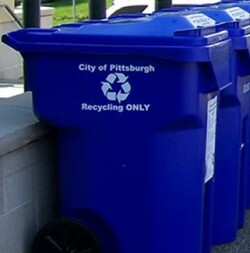 If you aren’t eligible for curbside recycling or you need to drop off some extra recyclables – the city of Pittsburgh has several recycling drop-off centers. North Dallas Ave. at Hamilton Ave.
off 5200 block of Second Ave.412-422-6524 Monday through Friday8:00 a.m. – 2:00 p.m. Facility is open 24 hours/ day. Open to residents, small businesses, bars and restaurants.Does NOT accept yard debris, scrap metal or tires. Monday through Friday8:00 a.m. – 2:00 p.m. Facility is open 24 hours/ day. Open to small businesses, bars and restaurants.Does NOT accept yard debris, scrap metal or tires. 412-243-5025. Facility is open during Construction Junction business hours. Does NOT accept yard debris, scrap metal or tires. What Can You Recycle in the City of Pittsburgh? Bicycles – donate bicycles and bicycle parts to FreeRide, which is located around the corner from Construction Junction. Plastic bags and grocery bags – most Giant Eagle stores have a plastic bag recycling box outside of the store. The bag recycling box at the Shadyside Giant Eagle Market District is located in the parking garage.